HOA RESERVE FUNDS – OR PETTY CASH FUND FOR BOARD MEMBERS? IS THE DBPR TAKING CAM LICENSING SERIOUSLY? DOES THE DPBR REALLY HELP? DO COMMUNITY ASSOCIATION MANAGERS GET AWAY WITH MURDER? DOES THE RIGHT TO BORROW MONEY GIVE BOARDS THE RIGHT TO BUY ANYTHING THEY WANT? WHO PAYS FOR THE LOAN? CAN YOUR ASSOCIATION BORROW MONEY? DISCIPLINE - NECESSARY EVIL TO KEEP WRONGDOERS IN CHECK? WHO CAN GET DISCIPLINED AND WHY? FIRST CAME THE STATUTES -- AND THEN THE COURT WARS! community association law and is the owner of Glazer and Associates, P.A. an eight attorney law firm in Orlando and Hollywood For the past two years Eric has been the host of Condo Craze and HOAs, a weekly one hour radio show on 850 WFTL. He is the first attorney in the State of Florida that designed a course that certifies condominium residents as eligible to serve on a condominium Board of Directors and has now certified more than 2,500 Floridians. He is certified as a Circuit Court Mediator by The Florida Supreme Court and has mediated dozens of disputes between associations and unit owners. Finally, he recently argued the Cohn v. Grand Condominium case before The Florida Supreme Court, which is perhaps the single most important association law case decided by the court in a decade. state management, leasing, and HOAs. Her company serves a diverse portfolio of properties, from 16-units up to 600 as well as large mixed-use developments. From its beginnings in 2000, CCM has become a well-respected asset manager and now works with over 100 associations with 16,000 units served by over 300 employees. Darlys and her team deliver resources and responsiveness through six regional offices - in Orlando, Miami, Jacksonville, Charleston, Nashville and Atlanta. Darlys Walker is best known for her passion and precision, understanding that the only difference that matters in today's demanding marketplace is service delivery ... doing what is promised and what is right. She knows that every community serves two masters ... the property owner/developer and the resident/homeowner. "If we are not equally responsive to both, we are not doing our job," she states. Her clients say it best: "Darlys really knows her stuff" ... "at the top of her profession and it shows in the caliber of her clients" ... "delivers quality resources that match up well with needs and expectations that are really rigorous." She is a licensed Real Estate Broker in four states, holds an Associate's Degree in Marketing and has earned the Accredited Real Estate Manager designation from the Georgia Institute of Real Estate Management. Also she is one of few certified as a Lead-Based Paint Abatement & Removal Trainer in Georgia. Darlys Walker and her team have been selected to manage the condominium conversion process and day-to-day operations for many of the Southeast's most high-profile condominium communities including luxury high-rises, mid-rises and garden-style homes. Most recently she has been recognized as an expert in 're-versions' of communities from condominiums to leased homes, as well as repositioning projects. A visionary and a tireless perfectionist, Darlys demonstrates hands-on leadership, working individually with each client and staff associate to achieve defined business outcomes and satisfaction. For more information about Darlys Walker and Condominium Concepts Management, Inc. please visit www.condominiumconcepts.com. associations. He moved to Florida in 1995 - hoping to retire. He moved into a HOA, where the developer cheated the homeowners and used the association dues for his own purposes. End of retirement! 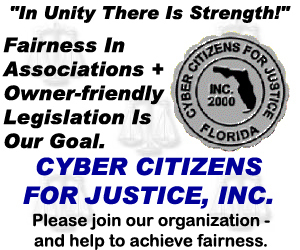 CCFJ was born in the year 2000, when some owners met in Tallahassee - finding out that power is only in numbers. Bergemann was a member of Governor Jeb Bush's HOA Task force in 2003/2004. We think that only owners can really represent owners, since all service providers surely have a different interest! We are trying to create owner-friendly laws, but the best laws are useless without enforcement. And enforcement is totally lacking in Florida !